Investigating the diverse variety of specialised footwear available for different aspects of bicycle riding. Once the ‘safety bicycle’ was introduced in the 1880s as a less hazardous alternative to the ‘penny farthing’ (which featured two wheels of very different sizes), cycling gained a following of major proportions in both Europe and the USA. By the 1890s, men’s and women’s cycling clubs flourished and both racing and more leisurely touring became major pastimes. Unsurprisingly, Victorian cyclists soon found that the clothing they normally wore was often not suited for their new hobby. This was particularly the case with the womenswear of the day, as their long skirts could prove dangerous if they tangled with the bicycle chains or wheel spokes. Special clothing was soon made available – such as shorter jackets and knee-length trousers worn with long woollen socks for the men and divided skirts for women. Enterprising footwear producers quickly made light and flexible cycling shoes to further enhance the rider’s pleasure. Since those early days, cyclists’ shoes have developed into technically-engineered, high performance products that in many cases have used science to boost the rider’s efficiency. A variety of purpose-made designs have evolved, each with its own niche market carved out by customers who engaged in a specific form of cycling. This article will investigate some of these designs and highlight how such footwear can assist cyclists to gain more enjoyment from their hobby or even achieve the ‘competitive edge’ over other riders. As cycling grew in popularity, it quickly became apparent that competitive adherents who wanted to go faster or power over rough terrain needed to keep their feet on the pedals. The simple answer was for bicycle manufacturers to provide buckled straps on the pedals, into which the shoe could be slipped. One problem such an arrangement could cause was when the buckles were tightened to a level that the feet would not come free if the cyclist fell off his or her bike, thus causing injury. While some cyclists still prefer this way to connect their shoes to the pedals, most modern cyclists’ shoes are designed to work with so-called ‘clipless’ (or ‘clip-in’) pedal technology. The term ‘clipless’ can be confusing, because the cyclist actually does ‘clip’ his or her shoes into pedals – but without using toeclips and buckled straps. While some cyclists still use those ‘traditional’ methods, riders have claimed that they can diminish the circulation of blood to the feet when they are tightened enough to permit efficient pedalling and control. Buckled straps and toeclips are said to be less comfortable than a clipless system and more difficult to release in an emergency situation. 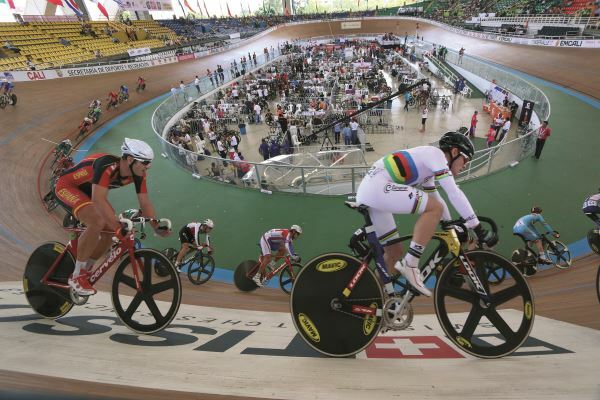 This article will concentrate on the more ‘modern’ clipless system. Clipless cyclists’ shoes generally feature threaded holes in the sole in various arrangements which are used to attach ‘cleats’ from different manufacturers. These cleats act in a similar way to a ski binding system by temporarily clipping into a matching fixing on the pedals. Cleats hold the rider’s feet in the correct place on the pedals and prevent their feet slipping from the pedals in wet weather. This system is also said to maximise the efficiency of power transfer over the complete pedal stroke, by permitting a continuous, smooth and circular motion which loses minimal energy as the rider can pull up on the pedals as well as push down. When correctly set up, the clipless pedal system has been designed to ensure that the cyclist’s foot is always in the correct position over the axle. While securing a cyclist’s feet to the pedals, cleats permit easy disconnection simply through a twist of the feet. Clipless shoes generally incorporate stiffer, thinner soles that flex less during pedalling than sports shoes for other disciplines. This is another design aspect intended to contribute towards greater power transfer. Cycling cleats have different amounts of ‘tension’, which is defined as how easy it is to clip in and out of the pedals. Most cleats can be adjusted by a simple screw mechanism. Over the years, concerns have been raised about this tension, with some commentators suggesting that new users of clipless pedal systems are not given sufficient guidance on the amount of tension they should use. This means that cleat users risk discovering that they have used too much tension only when they cannot release their foot from the pedal, sometimes resulting in a fall and potential injury. A survey on the use of cycling cleats published by the UK’s Royal Society for the Prevention of Accidents (RoSPA) in 2016 highlighted that respondents recommended that new cleat users practice in a park or similar location to ensure that their cleat/pedal tension is correct before they venture onto the road. Clipless pedal systems normally allow a certain degree of what is termed ‘float’ – the amount of lateral foot movement afforded before the rider’s foot is released from the pedal. It helps to ensure that riders avoid injury caused by riding with their feet misaligned with their knees. Float is controlled by using different cleat designs, which are available from zero degrees (giving no movement) up to about nine degrees. Some cleat manufacturers colour code their products to indicate the amount of float provided. There is an acknowledged problem that may be experienced by users of cycling cleats, as an incorrectly adjusted system can contribute to discomfort. Many people have feet that tilt (cant) – either to the inside (a ‘varus’ tilt) or to the outside (a ‘valgus’ tilt). However, cyclists’ shoes, cleats and pedals generally force the foot to be flat. To overcome this, the cyclist can fit ‘cant wedges’ between the cleat and shoe. These are intended to align the cyclist’s shoe so that his or her feet connect in a comfortable way with the pedals, taking into consideration the foot's natural angle, and thus creating a more ‘neutral’ foot position throughout the pedalling movement. If this necessary correction is not done, the cyclist may develop knee pain, foot ‘hotspots’ caused by uneven pressure around the ball of the foot, back pain or reduced power through the pedal stroke. One specialist company determines if wedges should be used by measuring the forefoot, making a physical assessment of foot condition, checking knee tracking and listening to feedback from the cyclist. The majority of inexpensive cyclists’ shoes incorporate an injection-moulded plastic sole, which is economical but heavier than the material used on most high-end footwear, as well as being more flexible. Mid-range priced shoes may use a sole made from a combination of plastic and fibreglass, plastic and carbon fibre, or entirely of carbon fibre. The most expensive shoes used in competitions use carbon fibre soles. Of course, the soling material and the amount of tread the shoe designer selects will affect its weight. An expensive pair of carbon fibre-soled road shoes can weigh as little as 400g, while a pair of mountain bike shoes at the budget end of the market might weigh up to 900g. With so many different uses for the bicycle in leisure, it comes as no surprise that a wide variety of cyclists’ shoe styles are available. Footwear has been designed specifically for use on the road, track or off-road terrain (‘mountain biking’), as well as for casual cycling, touring, in triathlon races, and for other applications. Road racing shoes: Shoes for road racing usually feature a smooth and inflexible sole, which is bent slightly at the ball of the foot. They are purely designed for efficiency, with the aim of transferring the maximum amount of power through to the pedals in order to push the cycle forward as fast as possible. These shoes may feature uppers with ventilation, which is available in a wide range of levels. At one end of the scale are highly ventilated shoes that incorporate holes in the sole in addition to mesh uppers, all of which increase breathability and comfort in hot summer months. By contrast, winter shoes or boots have minimal amounts of mesh or holes in their design, all of which could provide an entry route for water. They may also feature a higher level of thermal insulation. Winter shoes are described in more detail later in this article. 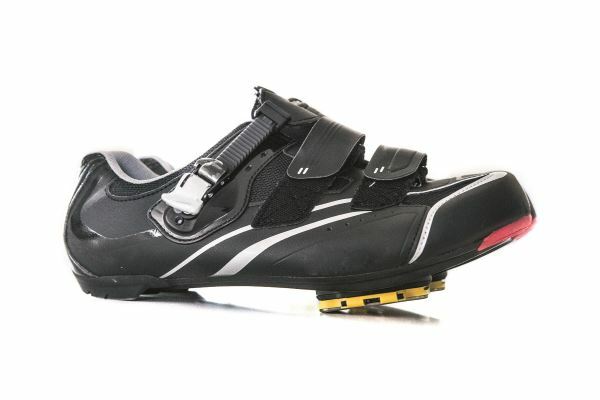 As these shoes are designed to function well while the rider is on his or her cycle, the style has little use off-bike. This is because most road shoes are fitted with a raised cleat which would make walking long distances very uncomfortable. There are three fastening systems normally used by designers of road racing shoes: touch-and-close (hook and loop) straps, ratchet buckles or dial cord fastenings. Touch-and-close fastening can be reliable, strong and lightweight. Ratchet systems are also sturdy, provide a firm hold onto the foot and allow simple adjustment even while on the move. The dial design is the lightest system available and is said to allow immediate and minute adjustments. ‘Track racing’ is usually held on indoor or outdoor banked and continuous tracks, often called ‘velodromes’. Cyclists’ footwear for this aspect of the sport are generally identical to road racing shoes. Triathlon shoes: The triathlon is a multisport endurance race involving three continuous and sequential phases. When staged at the Summer Olympic Games, it consists of a 1.5km (0.93 mile) swim, following immediately by a 40km (25 mile) cycle race and then a 10km (6.2 mile) run. The athlete needs to change quickly between each stage which means that, when starting the cycle race, there is no time to don socks or use buckles. Triathlon cycle shoes are usually pre-clipped to the pedals using a cleated system, and the athletes’ feet are normally inserted into their shoes after they start to pedal while pushing down on top of the shoe uppers. Loops are often incorporated into the heel of the shoe, allowing it to be pulled on quickly. 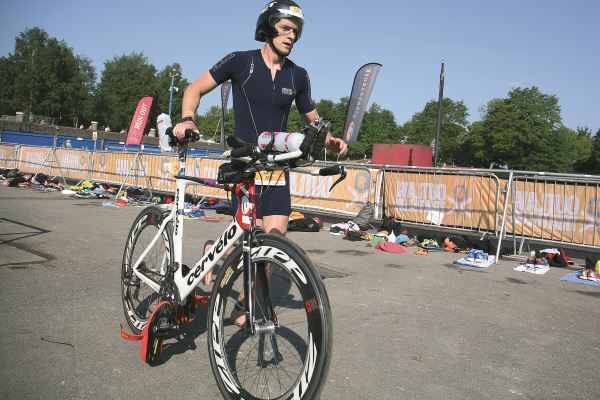 Triathlon shoes are normally a variant of road shoes, generally having a single large touch-and-close fastener, making it easy to adjust and undo the strap while on the cycle, and a design that allows for fast foot entry and exit. Ease of removal is vital as the athlete will almost certainly take his or her feet out of the shoes even before the end of the cycle stage of the race, leaving them clipped to the pedals. This footwear is also likely to be soft lined to provide comfort when worn without socks, and tends to be heavily ventilated to give good drainage (because the athlete will still be wet from the swimming stage). Some triathlon cycle shoes feature mesh panels to promote airflow over the foot. Casual cycling shoes: Very different from the uniquely-designed road racing shoes, footwear for ‘casual’ cycling generally has a soft outsole and features a moulded internal midsole to protect the rider’s foot from the pedal and to transfer energy in an even manner. Similar in shape to a street or trail shoe, this footwear normally incorporates an outsole with a lugged pattern. An attachment for a clipless pedal cleat is generally provided, the design of which allows for easy walking. 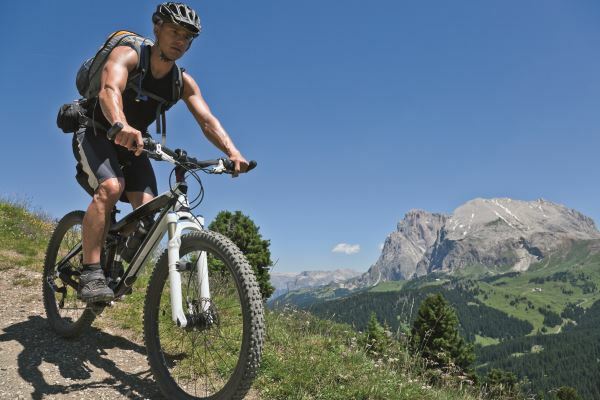 Mountain biking shoes: Shoes designed for mountain bikers are often styled very differently from racing shoes, frequently resembling trainers or hiking shoes. They generally use a cleat system, although these are very different from road racing shoe cleats, with the two versions being incompatible. As mountain bike shoes have a deep treaded outsole for better performance when the rider dismounts to run or to push or carry the cycle, the cleats are quite small and fit inside the lugs, thus keeping them away from contact with the ground. Some of these shoes also permit attachment of two screw-in spikes in the toe to provide added traction in mud or on steep trails. Midsoles made from injection-moulded nylon reinforced with fibreglass or carbon fibre, and hand-laid carbon fibre midsoles can all be found on mountain biking shoes. These shoes tend to be made of tough, water-resistant synthetic materials, and incorporate soles that exhibit more flex than road racing shoes. This choice of material is an attempt to achieve a comfortable compromise between maximum power transfer and the ability to walk off the bike. Designers of more expensive mountain bike shoes often use carbon fibre soles, and these are primarily aimed at racers who want to focus on power transfer. Such footwear offers a variety of ventilation levels. Winter boots may be membrane lined and have sealing cuffs to provide a level of water resistance. They are often insulated and provide over-the-ankle protection from cold, wind and moisture. Such shoes have been used by riders who have won the Iditasport extreme cycle race in Alaska. Shoes for summer racing are likely to feature a proportion of mesh covering the uppers, and be lighter weight products. 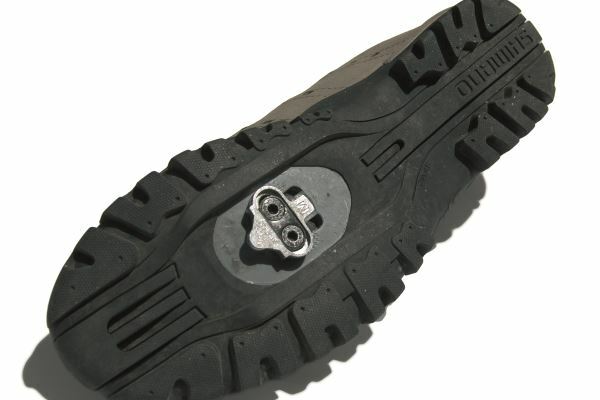 Closure for mountain bike shoes have a variety of closure methods similar to road racing shoes – touch-and-close fasteners, ratchet systems or dialled tension of lacings. So-called ‘touring shoes’ typically sacrifice a level of rigidity in order to provide traction and incorporate treads that have been designed for use with clipless pedals. As with shoes for mountain biking, the cleat is normally recessed to allow the rider to both walk and cycle, and the closure systems available may include traditional lacings. There are many factors which cyclists must consider when choosing new shoes for their sport. As there is no rolling motion of the foot experienced in cycling, extra room is not needed inside the shoes. According to one experienced provider of cyclists’ footwear, the length of the shoe is ideal if there is a 3-5mm gap between the front of the wearer’s big toe and the end of the insole. No compromise should be made on the width required. There should be no unnecessary pressure on the sides of the foot, nor any extra space. A good cyclists’ shoe should fit well enough to provide secure anchorage for the heel. The footwear should never slip on the foot, nor should there be any extra pressure or discomfort while walking. Women tend to have narrower heels than men and also usually have smaller feet. While there is a wide range of cyclists’ shoes for women (including in smaller sizes), the variety of choices is less than that offered to men, especially in the higher price bracket – perhaps due to a lower level of participation. As with all other styles of footwear, incredible technical advances have been in the design of cyclists’ shoes since the invention of the ‘modern’ bicycle in the 1880s. How far will this progress go? Only time will tell. Please email SATRA’s footwear testing team (footwear@satra.com) for help with the assessment of components and finished products. This article was originally published on page 8 of the February 2019 issue of SATRA Bulletin.